I think the best thing I've done is put all my stamp sets into Evernote so that I'll be able to pull different sets together based on some idea that pops into my head. For this one I painted some blue and green watercolors onto some Canson cold pressed watercolor paper, let it dry and then die cut the slanted rectangle. I then stamped the sentiment from My Favorite Things with Versafine Black Onyx ink. I then stamped, painted, and die cut the ship and wave from Papertrey Ink. As an aside...this set from Papertrey Ink is part of their mini doodle series and the price point is great! I mounted this to a kraft cardbase to finish it off. Thank you for reading this, and the materials used are listed below. Submitting this into the Simon Says Stamp Wednesday Challenge. Such a beautiful design, Mary! 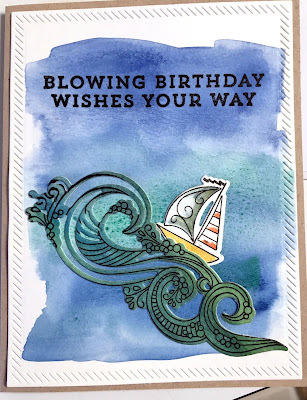 Your watercolor background is perfect and I love the dynamic lines of waves stamp&die. The little boat on the waves is darling! Thank you for joining us at Simon Says Stamp Wednesday Challenge!